Thread: Across Australia by Helicopter. This is the beginning of what I hope is going to be a trip of a life time. From Sydney in New South Wales to my home town of Kununurra in Western Australia in a R44 Helicopter a distance of around 4,000 kms at between 500 and 1,000 feet. 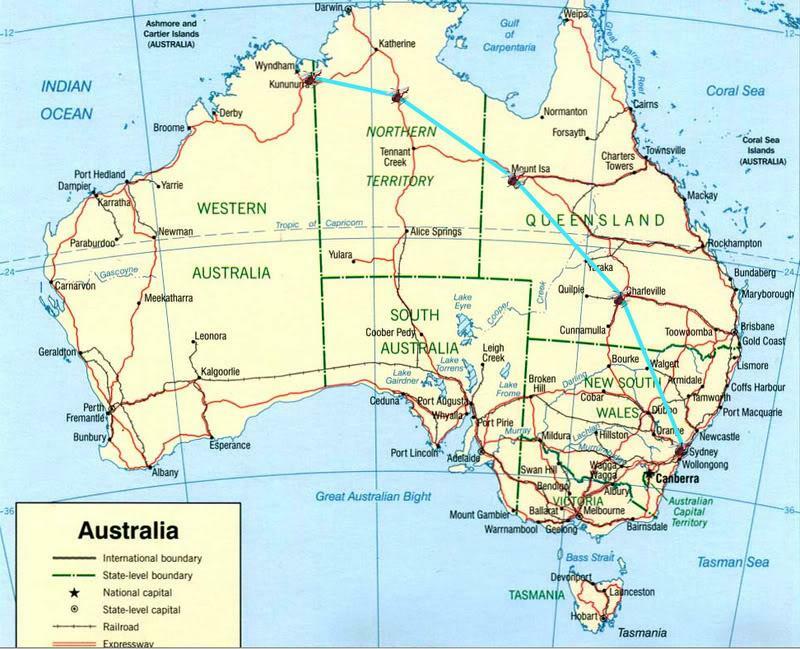 We plan to take 3 and 1/2 days to complete the trip stopping to sleep in Charleville, Mt Isa and Daly waters. There will be three stops per day between these points to take on fuel and to stretch the legs. For people who have no idea about these towns or Australia for that matter here is a map cimboc knocked up for me. 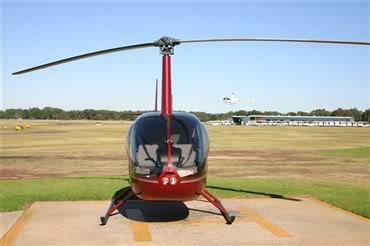 The R44 is brand new. 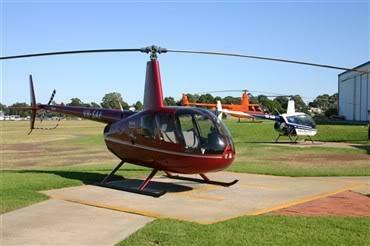 Here are some pics taken yesterday at Bankstown airport in Sydney. We plan to leave next Tuesday the 15th and arrive Friday lunch time the 18th. I will update this thread over the next 7 days as I get ready to go and then 10 days later when I return to NZ I will hopefully upload a stack load of awesome pics for you all. Last edited by MeMock; 06-04-2008 at 07:05 PM. Thanks for the map, I didn't know Kununurra was right up there. No wonder letters take 18 days from LOS. 18 days from Thailand to Kununurra? Sounds about right. It would have taken about 5 days to get to Australia and then 13 days bumping around on the back of a camel to get to Kununurra. Twelve re-fuelling stops on a 4000km trip ? And is it a RAVEN 1 or 2 ? Last edited by Thetyim; 06-04-2008 at 06:11 PM. Thats what I have been told although on the last day it might only be 1 so just 10 for the trip. We will be at max weight. Good question, I will find out for you. I am assuming it is a 1 but will double check. How many passengers will they be.? Make sure the front passenger has it drummed into his head not to touch the stick close to his right arm/leg. It can be easily knocked with nasty results. Actually that shouldn't be a problem in this case as the passenger in the front seat will be an instructor as the pilot is still on his 'L' plates. I am in the back by myself looking after ipod tunes for the other two. This pilot was a learner, too. Rather you than me Memock. Well the pilot will have actually finished his training (the day before we leave) but because he and the chopper need to get home he can't wait for the paper work to come through so therefore needs to have an instructor with him. the pilot is still on his 'L' plates. In that case you will probably have the full cyclic T bar fitted so that both pilots have control. No problem. As far as I am aware, the T bar will still be fitted. Yeah it is a pretty small tank and with three people + luggage there will be a few stops along the way! We will be at max weight. Where are you refueling between Sharlevile -- Mount Isa and Mount Isa --- Kununarra ? What fuel does it run ? Is it a turbine engine ? 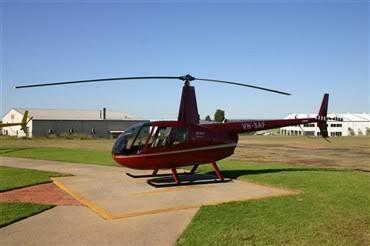 The R44 burns 100 low-lead Avgas. Good luck mate, looks like a great adventure. 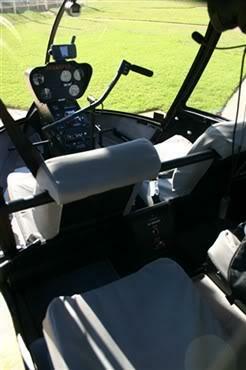 Although sayting that, i ride in helicopters to work and about an hour is enough for me. Sounds like quite an adventure. Looking forward to the trip report. Not sure exactly, where ever we can find fuel for sale I suppose. It is pretty isolated as you can imagine but all over the top end of Australia there are many choppers busy at work so there will always be somewhere you can find to top up the tank. I'm taking an intro chopper license flight sometime this week in the hope that I get to take the 'wheel' a little on this journey. Apart from that I won't be driving and therefore it will be a safe trip. I won't be driving and therefore it will be a safe trip. Have a great trip. Can't wait for the photos. Looks like a lot of folks will be following along. Always had a love affair with choppers klongy since being picked up at the bus stop and flown home one arfo from school by a bloke as a favour for my Dad. This chopper that we are flying home is indeed being leased to a local company and I was invited to come in and purchase 50% of it. I thought about it for a while but pulled out at the last minute however I will be watching it closely and might get involved at a later stage. I am looking forward to taking the wheel and if it excites me enough will consider getting my license. Never been in a chopper but have always wanted to. May get around to it one day but need a decent reason. A "joy ride" would only be a tease !